In 1850, Temperance Peabody, age 32, is a plain yet beautiful woman who has yet to know the thrill of romantic love. Raised in the Oregon territory where her parents established a strict religious colony, she was never allowed to have a suitor but now longs to have a family of her own. After her parents die and a cholera epidemic wracks the colony, Temperance feels called by God to take the surviving orphaned children back East to their extended families. But the only man available to accompany her on the dangerous journey is Thaddeus Brennan, a hard-edged drifter with good reasons of his own to get out of town. 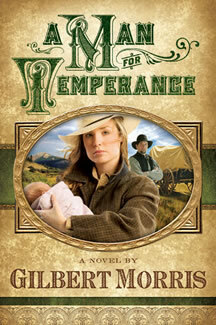 Despite the mismatch of Temperance’s purity with Thad’s hot temper, heavy drinking, and distaste for kids, the intensities of their trek help the two find common ground, perhaps enough on which to build a lasting relationship. But life and love are unpredictable. And when another man and woman join the journey, and a shock awaits two of the orphans, this hearty story of faith and new desires duly follows.